With Christmas fast approaching, Woden SEE-Change has organised a Pre-Christmas Op Swap which is open to all SEE-Change members, volunteers and interested people! If you don't have anything to swap, feel free to drop by and enjoy the entertainment and company of others as this is a SEE-Change wide end of year event! The Pre-Christmas Op Swap will take place on Saturday 4th December at St James Church, 40 Gillies St, Curtin from 9am (for a 9:30am start) until 12pm. This is a money-free event but we'd love it if you could please bring a plate of morning tea to share. As well as the op swap, there will be live music and a yummy morning tea. There will also be lucky door prizes: home air leakage test (valued at $400), organic wines, locally produced goodies and more. To find out more information and see the Op Swap flyer, visit the Pre-Christmas Op Swap events page. Australian charities are facing an uncertain future as donations from big retailers become increasingly rare and more and more people sell their unwanted goods online. Lifeline Australia's retail support coordinator Joe Magro, who has been working in the not-for-profit sector for almost 30 years, says big companies are now far more likely to to sell their surplus or damaged stock online than give it to the poor. As well as Myer, TIC is also used by Target and Kmart. "Anything and everything, stuff that is returned to the store and damaged, everything goes down to this place in Melbourne," Mr Magro said. "I've been there on about half a dozen occasions because once we were told the product would be going to Melbourne, but that we could purchase it from this TIC group, we started buying product - the product we were getting for nothing. "It was costing us a bit of freight and also about five cents in the dollar, so we were still getting a lot of stuff and good stuff. Mr Magro says it has become too expensive for charities to compete with other buyers, especially when more often than not, only half of the purchased pallet is re-usable. "You might get a pair of Italian shoes worth $600, so half a pallet is in really good nick, but the other half a pallet is rubbish that you've got to throw out," he said. "I dare say it could reach 20, 25, 30 cents in the dollar, which by the time you put freight on it's not worth it." He says he once received a donation from Table Eight worth about $1.5 million. "That was an order that was apparently the wrong colour, it was more bluey purpley and I think they wanted blue, so it was sitting there in their warehouse and they said I could take the whole lot," he said. "But I know years later when a new general manager came on board they then opened up a few Table Eight stores around Sydney where they could sell that product, so then the charities that were getting it couldn't get it anymore." Mr Magro says it is getting harder and harder for charities to rely on donations to stock their op shops, which in turn, is forcing up store prices. "Gone are the days where a lot of the product was given to us or donated to charities," he said. "If we want better quality product we pay for it at a reasonable price - something that we got for nothing, now we are buying it. "So where we used to be able to sell it for $2 or $3 in our stores, now we have to double it because we incurred a cost." Moreover, he says the quality of product is diminishing. "The major companies, we very rarely get product donated from them. The smaller fries, the ones that actually import clothes from China, they're the ones that we get product from," he said. "I've just come back from South Australia where I visited one of our centres, and when I was talking to the warehouse people the first thing they said to us was 'we're not getting any designer label products'. "Now the designer label stuff is what gets people in, that brings them into the shop." Mr Magro says 80 per cent of Lifeline's funding is accrued via its op shops, so without the shops, the organisation's other operations are at risk. "It's getting tougher and tougher and tougher for organisations like Lifeline, who are wholly and solely dependent on the money that comes though op shops, to fund their centres throughout the country," he said. "If our shops come down that could pretty much jeopardise the 24-hour counselling service, which is our core business." Red Cross merchandise general manager agrees donations from retailers are rare these days, and that the quality of donations from the general public is not what it used to be. "We find retailers are happy to donate their faulty stock, but for us at Red Cross we do have to spend quite a bit of time and labour sorting through that stock, identifying what is repairable, and then can be sold in our stores," Olivia Cozzolino said. "But unfortunately the proportion of items that can be prepared is fairly slim, so often the rest of the donations do have to be disposed of because they are beyond repair." Ms Cozzolino says the rise of eBay has also made things harder. "Whereas once upon a time people would have donated to a charity store now they know that they can put it on eBay and actually make some money from it," she said. "So unfortunately we do find that there is a decline in the quality and quantity of he things that we receive and that does make it difficult for us. "It does force us to go and purchase stock for our stores, whereas in the past we would have relied solely on donations." Both Mr Magro and Ms Cozzolino have urged retailers to reconsider donating their excess product to charity. "It's social responsibility, it's helping people less fortunate, people who wouldn't go into their stores and buy their brand names because they can't afford it," Mr Magro said. "It's giving those people an opportunity to wear an outfit they wouldn't normally be able to buy." "And those goods that they donate are then going on to the good of society by giving funds to the charities who really need it," Ms Cozzolino said. Mums, daughters and friends are invited to a fun fashion evening with Vinnies! Cost: $25 pp and a bag of pre-loved clothing. Great variety of second-hand books ! 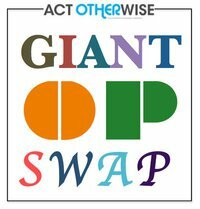 ACT otherWISE is hosting a GIANT OP-SWAP and recycling drop-off at the Belconnen Community Festival on Saturday 13 November 2010. The Festival is at Margaret Timpson Park (35 Benjamin Way, Belconnen) between 10am and 5pm. Bring clothes, books and other swappable items to the Festival and exchange them for something else. Come by any time between 10am-5pm. There is no minimum on what you can donate, but we ask that if you have bulky items, or you're unsure whether something is appropriate, please get in touch first. If you cannot attend the Festival, but would still like to contribute, you can drop your items off any time at the ACT Conservation Council (17 Childers St Acton - next to Street Theatre). There is a marked box just inside the front door. DON'T HAVE ANYTHING TO DONATE? Not a problem - just bring a donat ion to help cover the costs of running the event. Everybody who donates something in the lead up to the Festival, or brings something to swap on the day, will go in the draw for a fantastic prize. HOW WILL THE RECYCLING DROP-OFF WORK? We are collecting mobile phones (and accessories), printer cartridges and batteries. Just bring them to our stall and we'll send them away to be recycled free of charge. Lifted directly from Conservation Council Newsletter, November 2010.